Well, Christmas isn’t just about getting me presents and all that. Although some might say it’s a good starting point. Coincidentally, Christmas is also about when Mary and Judas fled from King Herod and baby Jesus was born behind the pub. And the Three Wise Mice brought gold, frankenstein and another one that’s just slipped my mind. And I think there was a lamb there as well? There was one on the Christmas card. Speaking of which, I got a lovely card this morning of a robin on a shovel handle from Barry Cryer. Do you leave a glass of sherry and a mince pie and carrot for Father Christmas and his reindeer? Well, sorry to drop a bombshell but I don’t really believe in Father Christmas anymore. And I have given this some thought. For a start, a fat man can’t get down a little chimney. He wouldn’t even be able to get his foot in it. It’s basic physics. A two-year-old could tell you that. Plus I estimate he’d have to eat about a million mince pies in approximately 8 hours. I rest my case. What do you expect your Christmas dinner guests to bring? Drink. Turkey. Potatoes. Sprouts. Stuffing. Carrots. Peas. Gravy. Crackers (Christmas, not Jacobs). Pudding. Presents. I don’t think there’s anything else? Oh and a tree. And lights for it. And a cheese board. After Eight Mints. 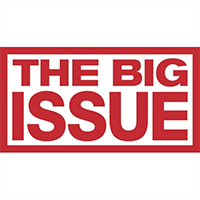 Do you have a Christmas message for Big Issue readers? Yes I do. My husband and I would like to take this opportunity, at this festive time of the year, to remind you that the dog you got for Christmas isn’t just for Christmas. Every year someone gets a dog that they think’s for Christmas and it’s not. Perhaps it would help if whoever got it, clarified when it was for? Just a thought. Condiments of the seasoning to you all.